If you know neither the enemy nor yourself, you will succumb in every battle." 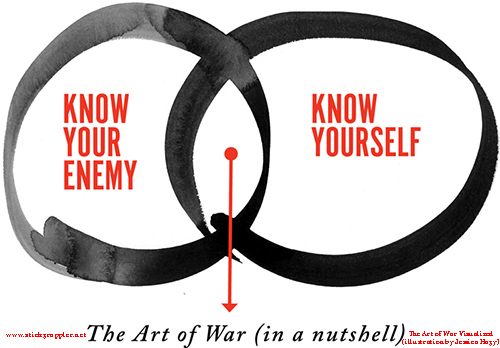 I came across a wonderfully illustrated book, "The Art of War Visualized" by Jessica Hagy. It is said that a picture is worth a thousand words and Hagy's book puts a fresh spin on a classic namely Sun Tzu's "The Art of War." Hagy uses charts and graphs to breathe life into Sun Tzu's timeless words. I recommend this book. Check it out! It's easy for many self-help books or life coaches to just say if you want to improve yourself you must first know yourself. Easy to say, hard to do when you don't know the first step on actually knowing yourself. It's not the 'What' but the "How!" How to go about finding out the "How?" "I'd Like to Teach the World to Dance"
Check out Jessica Hagy's book and hope Badger's essays helps!